Seventeen days before RHS botanical art exhibition set up. I set to work again as soon as we got home from church today. Although there is plenty of light in the shed I don’t know if it rains or shines. But I do know that on going up to the house for tea refills etc. it was very cold today. This is a small glimpse of my working environment at the moment – concentrated computering; but with the odd intrusion. It is not what I enjoy the most. I much prefer coloured pencil painting. But it is one step nearer getting the pictures finished for exhibition at the RHS. Don’t forget the date at the RHS Lindley Hall in London, 11 – 12 April, but with the awards given on the 10th. I hope people are either praying or keeping their fingers crossed for me. A couple of days ago I showed the blossom for the Malus Evereste. 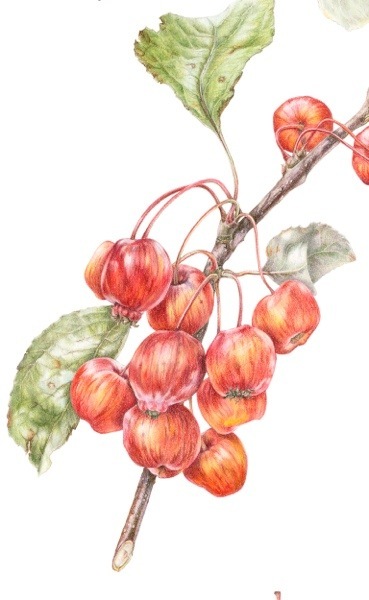 These are the crab apples. I first saw them during a workshop about three years ago, when a student brought them along to paint. I was very taken with their stripey look, but also that a few of them had an extra ‘lumpy’ skirt on them. They reminded me of a ‘cottage loaf’. I love the way cats just park themselves wherever the fancy takes them, nice to have such confidence. I watched your video on the Art Tutor site and I found it very interesting and picked up a useful tip about using a dark plummy colour under red for shadows. I have tried this out on a Photinia drawing I am doing and it worked very well. I’m glad that it helped. I find that one gets a few favourite colours and use them in all sorts of occasions. That colour is one of them. Yes cats a very loyal and it isn’t always about food!